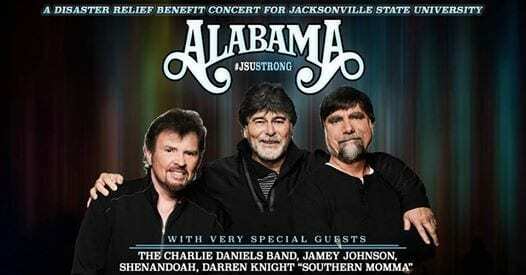 This fall, the legendary country music group Alabama will perform at the #JSUStrong relief concert in support of Jacksonville State University, which was devastated by a tornado this past March. On March 19, an EF-3 tornado touched down near the university, causing extensive damage throughout the city and on the college grounds. More than 50 buildings on campus were impacted, including 23 that were severely damaged. The country group Alabama will head back to their roots on September 26 with a benefit show at Burgess-Snow Field. All concert proceeds will be donated to the university’s disaster relief fund. The disaster hit close to home, since lead singer Randy Owen graduated from JSU. He said that he is devoted to give back to the community that gave “so much” to him. “As a proud alumni, Jacksonville State University is not only in our home state, but also very near and dear to my heart. A tremendous amount of damage has been done to the campus that must be rebuilt and we are ready to do our part to help reconcile the devastation. “Just as we did with the Alabama Fundraiser Concerts when the 2011 tornadoes hit, we continue to want to help. And one way we can help is to do what we do best, play music with our friends and raise money for the university repairs. When I asked my bandmates and cousins Teddy Gentry and Jeff Cook, whose wife Lisa is also a JSU alum, they were both thrilled to pitch in and help out. Among Alabama, special guests The Charlie Daniels Band, Jamey Johnson, Riley Green, Shenandoah, and Darren Knight will take the stage. Yesterday, the rest of the lineup was announced, including Jason Isbell and the 400 Unit, John Berry, Gordon Mote, and SiruisXM’s Storme Warren. According to the JSU Gamecocks’ website, 90 percent of tickets have already sold, making the event the year’s largest live stadium concert in Northern Alabama. The show, which will be held rain or shine, begins at 6 p.m. CT.
Visit Ticket Club to find tickets to the tornado relief concert this September.